It’s cold. Really really cold. And because it’s cold we need warming, nutritious, comforting food. We need it to be quick and easy and relatively painless. This is all of those and the only downside was that I didn’t make more of it – I halved the recipe to feed 3 of us and I should never do that. I’m a bit of an Ottolenghi fan but even I can find all the spices a little too much to handle at times. This recipe uses the softest of spices which makes it a treat without being overly fussy. It’s also incredibly easy to make and I shall be probably be cooking it very often indeed. 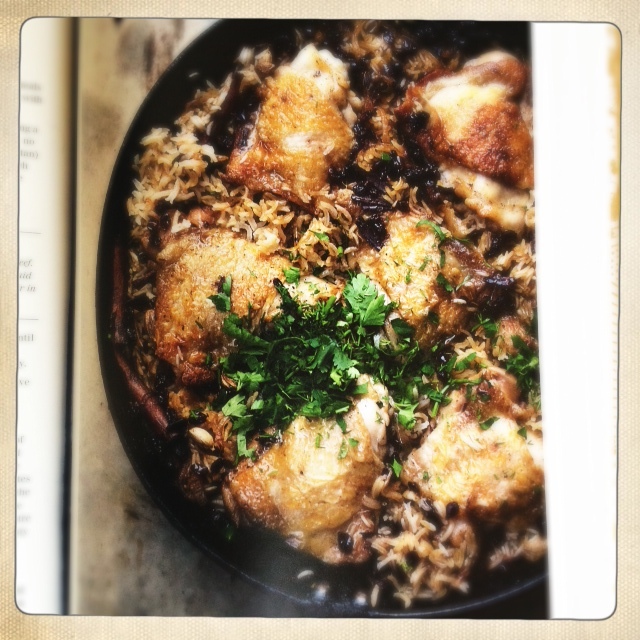 I actually think this one could turn even the most hardened of Ottolenghi cynics. Meanwhile, heat half the olive oil in a large sauté pan for which you have a lid, add the onion and cook over a medium heat for 10-15mins, stirring occasionally, until the onion has turned a deep golden brown. Transfer the onion to a bowl and wipe the pan clean. Place the chicken in a large mixing bowl and season with 1 & 1/2 teaspoons of salt and black pepper. Add the remaining olive oil, cardamom, cloves and cinnamon and use your hands to mix everything together well. Heat your frying pan again and place the chicken and spices inside. Sear for 5mins on each side and remove from the pan (this is important as it part-cooks the chicken). The spices can stay in the pan but don’t worry if they stick to the chicken. Remove most of the remaining oil as well, leaving just a millimetre at the bottom. Add the rice, caramelised onion, 1 teaspoon of salt and plenty of black pepper. Strain the barberries and add them as well. Stir well and return the seared chicken and push into the rice. Pour the boiling water over the rice and chicken, cover the pan and cook on a very low heat for 30 minutes. Take the pan off the heat, remove the lid and quickly place a clean tea towel over the pan and seal again with the lid. Leave the dish undisturbed for another 10 mins. I have a new social media addiction. I doubt it will quite take over my love of Instagram but it’s going to be a close one. 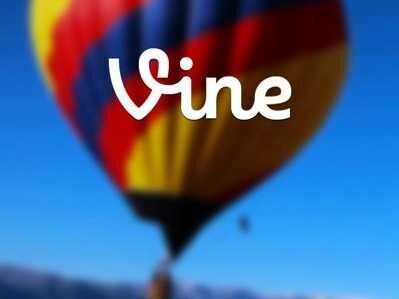 Vine is a FREE app for iPhone and iPad which allows you to film 6 second movies. You hold your finger down on the screen for as long as you want to record which means you can do six 1 second pieces of film (or more / less) which is then edited automatically and posted. You have the choice to share your movies just within the Vine community, or further afield through your Facebook and Twitter profiles. The platform looks like Instagram but with moving images. Download it now and have a look at some of the Editor’s pics. It’s amazing what you can do with 6 seconds of film.